As Tesla Model 3 launch is approaching closer and closer in July, the excitement is all time high for Model 3 reservation holders, fans and enthusiasts. Therefore we have to cover each and every aspect of the vehicle to be informed on what is ahead of us. Thought of comparing exterior dimensions to other cars that are direct or indirect competitors of the Model 3 to get an idea of the size, comfort and expected driving experience of the car. Let’s look at the comparison chart below for 2017 model cars from the likes of Ford Focus, BMW 3 Series, Honda Civic to Chevy Malibu & Mazda 6. I have added the chart separately in Metric units (mm) as some of our valued audience was having trouble with the chart being only in Imperial units (inches). Updated the tables with official dimension values after full & final specs and prices unveiled by Tesla after delivery event. 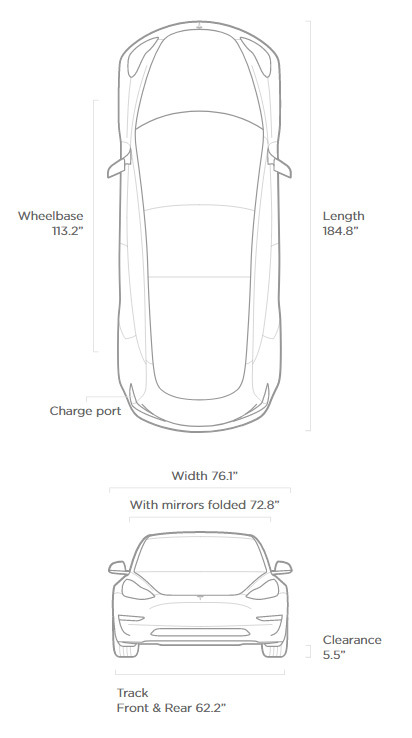 Figure describing Tesla Model 3 exterior dimensions released after delivery event. *You might need to rotate your mobile device horizontally to show the full width of the table. So as we can see Model 3 has a significantly longer wheelbase compared to similar dimension cars such as the Honda Civic, BMW 3 Series, VW Jetta and the likes. The closest wheelbase length is of the Audi A4’s (110.6 inches) which is actually a longer vehicle by overall length than the Model 3. The only car in this chart surpassing a longer wheelbase than the Model 3 is Tesla’s own Model S which has a 116.5 inch long wheelbase. The longer wheelbase allows for more battery packs and interior space for the upcoming Model 3. Also the height of the vehicle is identical to that of the Model S which ensuring comfort for taller people who want to go green with an affordable electric car. The interior dimensions of the Model 3 are still unknown as the automaker is going stealth regarding the interior. Also in-spite of several Model 3 spy sightings no one is able to get even a clear interior picture of a production candidate yet. Let the world know your thoughts in the comment section below or stay tuned for future updates by following our Facebook Page. Seems like a very common size so it will be perfect for most people. We have a friend or two who are 6 foot 10 and they fit in many cars reasonably well. A few are awkward. The new chevy Bolt was good for him. Were can’t wait to have him try the Tesla Model 3. 6’10” seems to much for the smaller #Model3, hope it works for your friends, do let us know when you’ve tried them driving the Model 3 and maybe capture a video, it’d be good to showcase taller people using Model 3 easily !